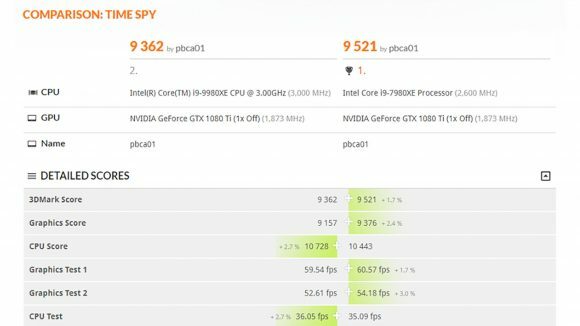 Intel’s Core i9 9980XE has strut its stuff in 3DMark Time Spy, showing moderate gains over its predecessor, the i9 7980XE. While built on the same 14nm process node and Skylake-X microarchitecture as the generation past, the refreshed CPUs, set to launch in November, will push clocks slightly further than previously thought possible on the HEDT platform. Intel has, yet again, managed to squeeze a little more out of its 14nm process since the Core i9 7980XE first graced PCs back in the dog days of summer ‘17. 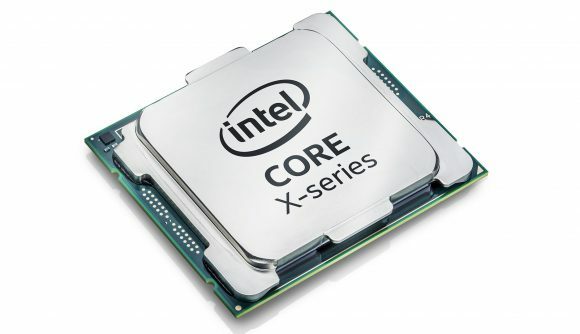 This has resulted in a 400MHz base clock bump between the i9 9980XE and i9 7980XE – 2.6GHz to 3GHz, respectively – and a 300MHz boost clock increase – from 4.2GHz to 4.5GHz. Aside from clock speeds and a return to solder, very little has changed between these two chips once you get down to the silicon level. Both are built upon the Skylake-X microarchitecture, feature 18 cores and 36 threads, come with 24.75MB of SmartCache on the die, support quad-channel DDR4-2666 memory, and will utilise the X299 motherboards fitted with the LGA 2066 socket. That extra horsepower equates to a score of 10,728 in 3DMark Time Spy, or single-digit gains – somewhere in the realm of three percent – between the i9 9980XE and i9 7980XE when comparing scores provided by the very same user – pbca01 – for both chips. The processor’s listed specs on the entry – spotted yet again by TUM_APISAK – match that which Intel released a few weeks back at its 9th Gen launch event. Is that performance uplift worth a generational upgrade? Certainly not. But at least if you are planning on spending $1,979 on a shiny new HEDT CPU you’ll receive a faster chip for all that dollar than you would’ve this time last year. Intel is still grappling with its 10nm process, and these iterative updates are largely all it can offer at this time without serious architectural changes – the likes of which we won’t see until yields are up on the denser node. Intel’s Skylake-X platform has to compete with AMD’s Threadripper processors, giant multi-chip module CPUs intent on turning the HEDT platform on its head since their release. Threadripper offers higher core counts, for considerably less money than Intel’s current lineup, with the $1,299 24-core, 48-thread 2nd Gen Ryzen Threadripper 2970WX having just launched globally today. Hell, even the 32-core, 64-thread 2990WX is nearly $200 cheaper, and that launched back in August. Chipzilla really does have its work cut out convincing users to not defect to the red team – especially if AMD can deliver strong 7nm-driven performance uplift in 2019 too.